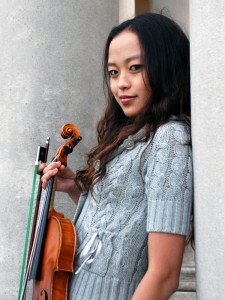 Eunice Kim (violin), when she won the Khuner Competition in 2008, was a student of renowned violinist Wei He in the Preparatory Division at the San Francisco Conservatory, on the Morris Stulsaft Scholarship. She started the violin at age six, and made her debut at the age of seven with the KBS symphony in Seoul, Korea. She performed her first solo recital at the age of 11 at Herbst Theater in San Francisco. When she won our competition, she was the concertmaster of the San Francisco Conservatory of Music’s Prep Chamber Orchestra and the School of the Arts orchestra. She had performed a gala concert with renowned mezzo-soprano Frederica von Stade. During her high school years, Eunice had performed concertos with the Fremont Symphony, Oakland East Bay Symphony, Aspen Festival Orchestra, and the School of the Arts orchestra. She represented the San Francisco Conservatory at a concert at the Kennedy Center in Washington D.C., which was broadcast nationally. She has been heard on From the Top public radio program, recorded at Jordan Hall in Boston. She won several competitions in California and attended music festivals, including Aspen Music Festival, Great Mountains Music Festival in South Korea, Icicle Creek Music Festival and Summit Music Festival, Music@Menlo, Hotchkiss Summer Music Portal and the Taos School of Music.